Lenovo’s ThinkPad lineup has always been focused on balancing tradition with modernity. It carries the legacy of IBM’s iconic laptop brand, but the company also has to make sure it keeps up with the competition. That’s truer than ever with the new X1 Carbon, Lenovo’s flagship ultraportable, which packs in Intel’s latest chips and a few nifty upgrades. It doesn’t have a folding screen, and it can’t be turned into a slate like the X1 Yoga and the Tablet can. It’s simply a laptop — but it’s one that’s polished enough to compete with the likes of Dell’s XPS 13 and Apple’s MacBook Air. The Lenovo ThinkPad X1 Carbon has everything we’d want in a business ultraportable. It’s sturdy, fast and light. You’ll just have to pay a bit extra to get the best display and newest features. 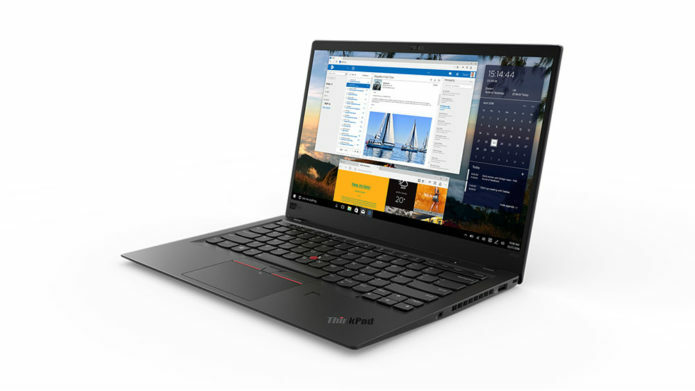 Now in its sixth generation, the X1 Carbon retains everything that’s made the line an ideal productivity machine over the past few years. It starts out at just 2.5 pounds and measures 16 millimeters thick. It’s noticeably lighter than the 2.7-pound XPS 13, so much so that it’s hard to tell that it’s actually a bit thicker. The X1 Carbon’s sturdy carbon-fiber case returns, as does the soft-touch coating, which makes it feel surprisingly luxurious, especially on your wrists. Aside from some branding tweaks, nothing has changed design-wise. You’ll be able to tell it’s a Thinkpad from across the room. For some users, though, that’s more a feature than a compromise. There’s something comforting about the clean lines of the traditional ThinkPad. Lenovo has modernized the Carbon line over the years, of course — the bezels around the screen got thinner, for example — but not so much as to hide its heritage. Lenovo also brought back the touchscreen option in the Carbon’s 14-inch display, which was missing in the last generation. It’s a nice thing to have, especially when browsing around the web, but the laptop’s matte finish makes the touch experience a bit rough as compared with mobile glass screens. Our review unit came with a standard 1080p display, but you can also upgrade to a higher-resolution 1440p model that packs in Dolby Vision HDR. Despite the lower resolution, the screen looks great when browsing the web and watching movies. But if you plan to watch a lot of movies, or you just want the latest tech, it’s worth springing for the HDR option, which will deliver deeper blacks and brighter highlights. The slight jump beyond 1080p will also make text and photos a bit sharper. If you’re privacy conscious, you’ll definitely appreciate the physical shutter that can be used to block the webcam. It’s a better option than tape, but it would’ve been nice if it were easier to switch on and off. It requires a decent amount of force to be moved, and you might lose a bit of fingernail in the process. Unfortunately, there’s no Windows Hello support in the webcam unless you upgrade to the higher-resolution monitor. It’s unclear why that is, but it might be due to the size of the 1080p panel. At least the fingerprint reader is more secure than before. The sensor can authenticate your identity entirely on its own, without sharing any data with the computer. The laptop also features two far-field array microphones, which can be useful when you’re shouting commands at Cortana from across the room. As for connectivity, the Carbon X1 features two Thunderbolt 3–compatible USB-C ports, which can also charge the laptop, as well as two USB Type A connections and an HDMI port. There are also micro-SIM and micro-SD card slots tucked away in the back. The Carbon X1 isn’t exactly a surprising machine — it’s a rock-solid, ultralight business laptop. It sports the same killer keyboard found on all of Lenovo’s professional machines, with a liberal 1.8 millimeters of travel. Typing on it felt better than many desktop keyboards I’ve used, and it certainly blows away Apple’s disastrous flat MacBook options. The touchpad is smooth and accurate, and I’ve got to give Lenovo credit for sticking with the iconic red ThinkPad nub. It takes a bit of getting used to, but it’s a great way to maneuver through Windows in cramped environments. The Carbon X1 is powerful enough to handle most productivity tasks, thanks to Intel’s 8th-gen processors. Since there’s no dedicated graphics, it’s not a great option for playing games or 3D rendering, but that won’t matter to business users. For the most part, what struck me about the Carbon X1 was just how much it felt like those old ThinkPads I used to adore in the Windows XP era. Of course, it’s a lot lighter and thinner, but it felt just as reliable and empowering. It booted up quickly, launched everything I needed without skipping a beat and, most important, never left me wanting for more power. In our battery test, which involves looping an HD video, the laptop lasted for 15 and a half hours. That’s among the best we’ve seen in ultraportables. While using it a bit more realistically throughout the day, it typically lasted for eight hours. The ThinkPad X1 Carbon starts at $1,519 with a Core i5 8th-generation processor, 8GB of RAM and a 256GB M.2 SSD. Personally, I’d spend the extra $180 to add the HDR 1440p screen. As usual, you can customize just about every component of the machine on Lenovo’s website, so you’re not just stuck with preconfigured systems that might include features you don’t want. Not surprisingly, being a business-class machine, it’s more expensive than typical ultraportables. The XPS 13 starts at $999, and you can even get a MacBook Pro cheaper than the Carbon X1 with similar specs and an older 7th-generation Intel CPU. Basically, you’re not buying a ThinkPad if you’re trying to save money. While the ThinkPad Carbon X1 isn’t a huge evolution over last year’s model, Lenovo packed in enough upgrades to keep the line in step with modern ultraportables. Unfortunately, you’ll have to go beyond the entry-level model to see the best new features, like the HDR display. Perhaps next year we’ll see a major design leap for the Carbon line — but, knowing the rabid ThinkPad fans out there, Lenovo will have to tread carefully. Bold new ideas are what the X1 Yoga and Tablet models are for. The Carbon, meanwhile, remains the most refined business laptop around.